348 pages | 279 Color Illus. | 21 B/W Illus. Patrick McHaffie joined the faculty at DePaul University in 1996 after academic appointments at West Virginia University, Dartmouth College, and West Georgia College. During the 1980’s he served with the Kentucky Geological Survey where he conducted environmental research related to coal mining, directed the National Cartographic Information Center affiliate office, and coordinated the State Topographic Mapping Program. His research interests and publication history include the social history of cartography and GIS, the cartographic labor process, cartographic ethics, the geography of education spending, Appalachian social geography, and the social construction of the global. He currently is completing a study of highway planning in Chicago during the cold war. His work has been supported by grants from the National Science Foundation, History of Cartography Project (University of Wisconsin), and the University Research and Quality of Instruction Councils (DePaul University), and he holds a GISP certification. Sungsoon Hwang is an Associate Professor in the Department of Geography at DePaul University. She received her B.A. in Geography Education from Seoul National University. She received her M.S. 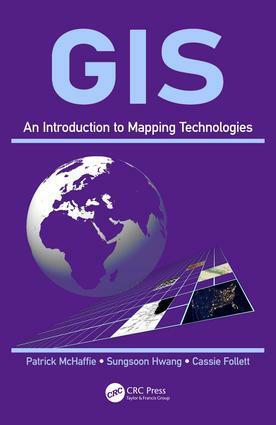 in Geographic Information Systems from University of Nottingham. She received her Ph.D. in Geography with a concentration on Urban and Regional Analysis from State University of New York (SUNY) at Buffalo. She has created and taught 20 courses related to GIS. She has published on fuzzy geodemographics, GIS for sustainability education, and uncertain GPS trajectory computing in the disciplines of geography, urban planning, and computer science. Cassie Follett is the GIS Coordinator for the Department of Geography at DePaul University, helping to plan and expand GIS capabilities on campus and managing the new GIS Lab on campus. Before coming to DePaul she worked for NASA and the federal Environmental Protection Agency, and received her MA from West Virginia University while researching big data and open source web GIS. She holds a bachelors with double major in Geography and History from Carthage College. She is a volunteer with several open source GIS projects such as Cesium and QGIS, and is currently a "Hacker in Residence" with local Chicago startup Hologram, and a "Cyberacademy Fellow" with SANS. She is currently pursuing a second MS at DePaul in Computer Science.? Her research interests are participatory GIS, GIS programming, critical GIS, environmental justice, and virtual reality.